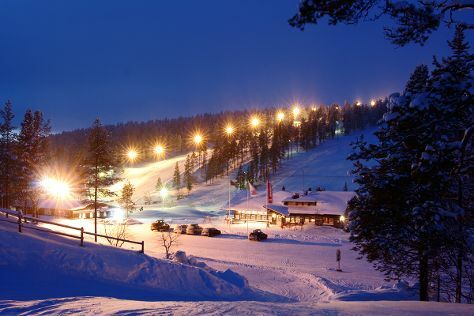 Get outdoors at Nature & Wildlife Tours and Saariselka Ski & Sport Resort. Eschew the tourist crowds and head to Lake Inari and Pielpajarvi Wilderness Church. For traveler tips, reviews, more things to do, and other tourist information, read Inari trip itinerary planning tool . Strasbourg, France to Inari is an approximately 16.5-hour flight. You can also drive. The time zone changes from Central European Time (CET) to Eastern European Time (EET), which is usually a 1 hour difference. Traveling from Strasbourg in April, you will find days in Inari are cooler (3°C), and nights are little chillier (-6°C). Finish your sightseeing early on the 24th (Wed) so you can drive to Rovaniemi. Escape the urban bustle at Pyha-Luosto National Park and Syvasenvaara Fell. Explore hidden gems such as Ounasvaaran Hiihtokeskus Oy and Your Piece Of Finland. There's lots more to do: snap pictures at Lumberjack's Candle Bridge, stroll the grounds of German Soldier s Cemetery, and browse the collection at Rovaniemi City Library. For reviews, ratings, photos, and more tourist information, use the Rovaniemi trip itinerary builder app . Drive from Inari to Rovaniemi in 4 hours. Alternatively, you can take a bus; or fly. Expect a daytime high around 3°C in April, and nighttime lows around -3°C. Wrap up your sightseeing by early afternoon on the 27th (Sat) to allow enough time to travel back home.